Second Sortie. More beautiful illustrations from the Macross artist 天神英貴 (Tenjin Hidetaka). 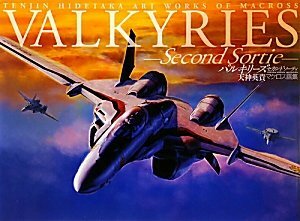 This second volume follows the format of the first, バルキリーズ 天神英貴マクロス画集 (Tenjin Hidetaka Art Works of Macross Valkyries). It's still a paperback but it has 112 pages, less than the first volume. This volume is slightly cheaper because of that. The illustrations are from the box art, event posters and anime box sets. The planes are gorgeous, as usual. The textures on the planes are really well done. The details are amazing, right down to the rivets that hold the planes together. There are also the transformed mechas, the SDF-1 aircraft carrier and even the chibi egg plane versions. The book ends with some keyframes and VFX effect stills from the animation Macross Frontier. There's an interview with Tenjin Hidetaka and Takani Yoshiyuki right at the back, in Japanese. I like the first volume slightly more, maybe because there are more pages. Great book for fans of Macross and plane collectibles.